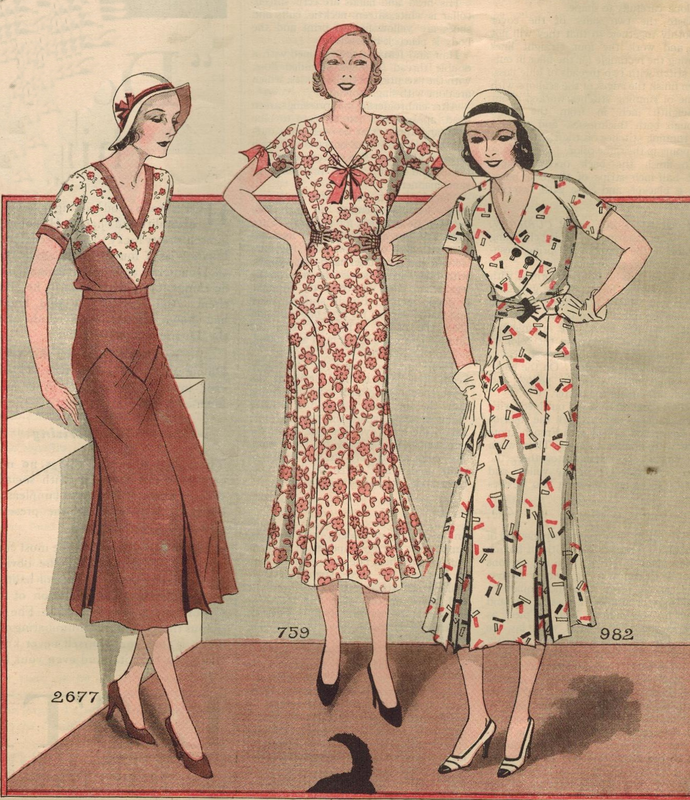 Let's bid the merry month of May farewell with a handful of graceful and flattering tea-length frocks from 1932! Dress 981 has a rather tailored air, with buttons at the hip, a smart center front inset, and a pleasing neckline treatment. Dress 2551 is a simple and neat affair - pin tucks at the neckline and wrists add distinction. Dress 2677 is slim, with crisp inverted pleats adding graceful flare to the skirt. Dress 759 has slimming flare, front and back panels from neck to hem, and sweet bows as accents. Dress 982 has a smart bodice closing, raglan sleeves, and princess seams the release into double inverted pleats. I never did like 1930s fashion untill recently but ever since I've found it thoroughly fascinating! Have you seen 'Mildred Pierce' with Kate Winslet? I think that's where part of my new-found fascination with 30s and 40s fashion began. I am so glad that you like them - I agree that they are wonderful. And thanks for the tip about Mildred Pierce - I've never seen it, and so have just added it to my Netflix queue! You should definately see Mildred Pierce. Not only is it a visually stunning movie with an absolutely amazing actress, it's also a wonderfully told story of a woman raising a family in the hard times of the Great Depression. Sounds great - I'll let you know what I think of it, for sure. With such an enthusiastic endorsement, I'm really looking forward to it! Early 1930s dresses are my favourite! Those raglan-sleeved dresses are really inspirational. A 1965 Holiday Salute in Red, White, & Blue!